Chincoteague Island has been a favorite beach vacation destination for years. Families have enjoyed visiting the island for generations. Things have changed some over the years - the most noticable recent change has been the number of condos that have been constructed on the island. And while all the hotels were once family-owned operations, the Best Western and Comfort Suites chains have opened properties on the island. The addition of lots of new condos means more rental opportunities for visitors. Plus, there are still plenty of traditional vacation home rentals available. Chincoteague Island is located inland of the larger Assateague Island, where the beaches are. Assateague is protected as a National Seasore and Wildlife Refuge, while Chincoteague provides housing, hotels, dining, and other amenities. The two islands are connected by a causeway bridge. 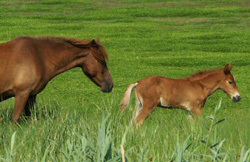 Chincoteague visitors can spend the day on the beaches on Assateague National Seashore, see the famous Chincoteague Ponies and other wildlife at the Chincoteague National Wildlife Refuge, and enjoy dining and shopping in a small-town island setting. Waterfront Home on Assateague Channel - This three bedroom waterfront home is located on Assateague Channel and overlooks Assateague Island. Has a large screened porch and open decks. New Home in Downtown Historic Area - New construction designed in traditional Chincoteague style. Located in the downtown Main Street area. 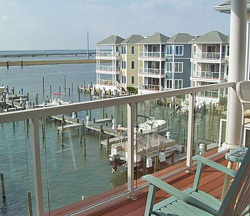 Sunset Bay Condo -This three bedroom condo unit is waterfront on Chincoteague Bay. Within walking distance of downtown Main Street area. Guests have use of swimming pool and fitness room. There's a private community marina for fishing and crabbing. Washer & dryer in the unit. Waterfront Home on Chincoteague Channel - Five bedroom home with great waterfront views, elevated deck/gazebo. 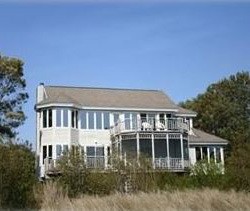 See More Chincoteague Vacation Properties - Over 200 Chincoteague rentals with traveler reviews. Additional Chincoteague Island Rental Properties - over 50 more to choose from. Chincoteague Island/Assateague Island Hotels - Find hotels on the island and nearby.